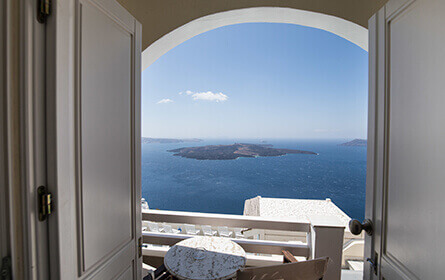 Located on the first floor and the second floor, each of these rooms has its own private balcony that provides a complete view of the Caldera. Don’t worry about missing out on the volcano though because that can be seen from the west facing window. Two beautiful and very different views that you will no doubt want to capture and keep with you forever. One of the rooms includes a Queen sized bed and the other a twin which can also be converted into a Queen, depending on requirements. To avoid disappointment, please specify your preference on the booking form. The accommodation includes a private bathroom complete with shower, as well as refrigerator and other modern facilities. Once you tire of the views from your room (and we think you will struggle to do so!) even more of the Island awaits you from the pool deck which is easily accessible. From here you can soak in the beauty and diverse nature of the Santorini landscape. As well as further unobstructed views of the Caldera gulf and volcano, you will also be able to see Firostefani village, Akrotiri and Thirasia Island. Then of course, there is the famous Santorini sunset which is sure to give your friends at home holiday envy!